The photos are from the first Sunday in December, 04.12.2016. 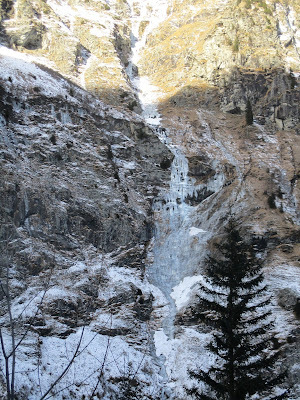 I have been in the Gastein valley three times now to climb some early season ice. The pictures are from various side valleys at the end of the main valley, in Bockstein and Nassfeld. If you zoom-in on the photo above you'll see a rope team in this moderate classic. Of course the various climbs that are formed are more serious and technically more difficult than their guidebook ratings. 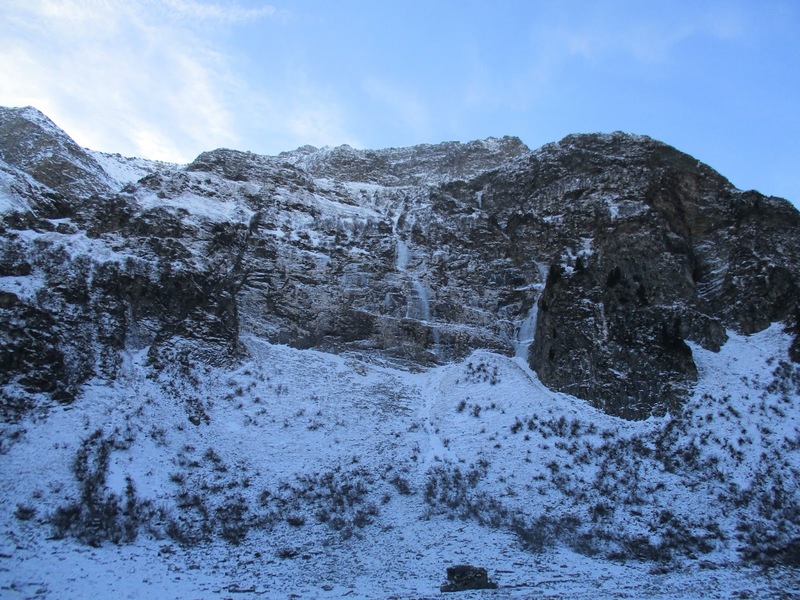 The ice is more fickle to protect and not as compact and steeper as it is not filled in. 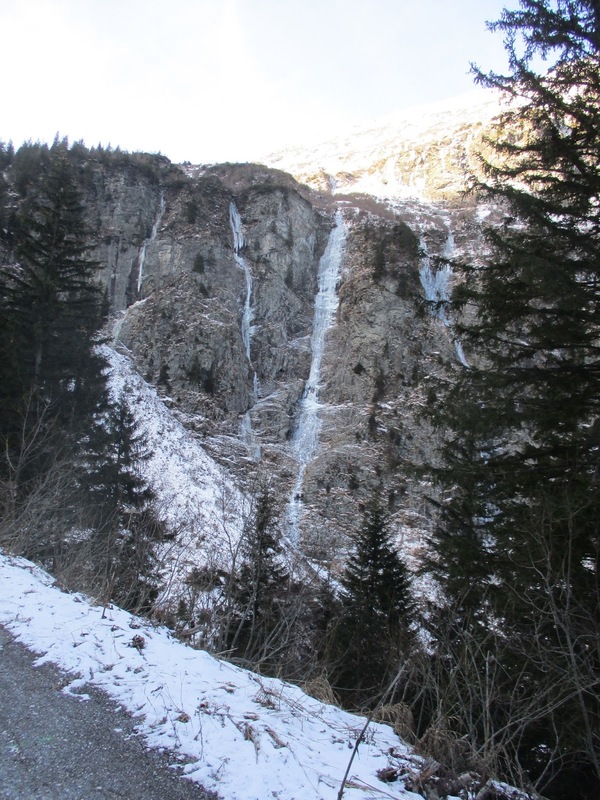 A benefit of the lack of snow is that the threat of avalanches is non-existent in all the climbs to the right of the toll road unto Sport Gastein. 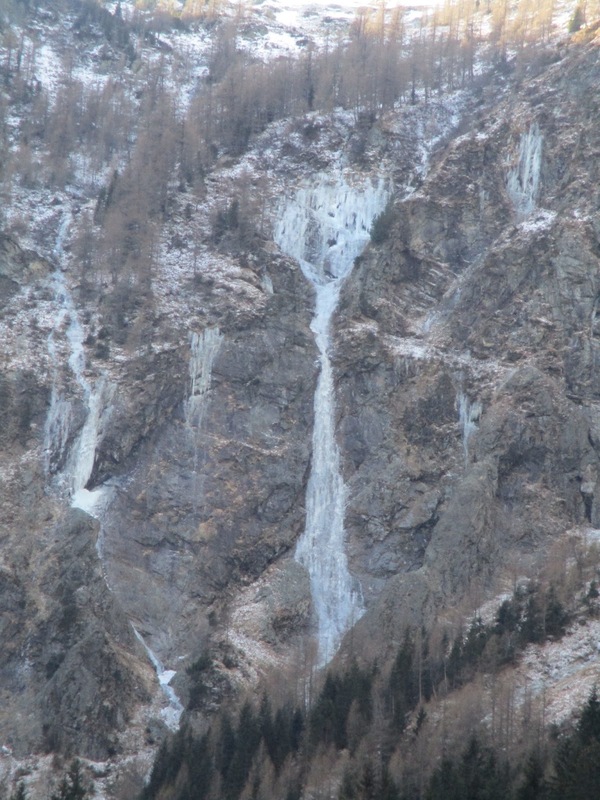 There are two or three falls that are well enough formed (on 04.-09.12.2016) but will be much more susceptible to any weather and temperature fluctuations. At the higher elevations in the Siglitz valley, the easier long embedded ice is compact and thickly built up. Additionally, the lack of snow makes all the low-angle climbs visible and fun to climb without their normal covering of snow to slog through in the flatter sections. 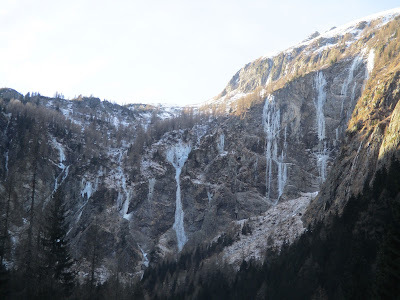 Specifically, I have climbed Federweis, Dopple Lutscher, Siglitzfall, Siglitz Coulior and some other easy lines at the back right side of the Siglitz valley in the direction of the Niedersachsenhaus under the Riffelscharte. As of today, 12.12.2016, we have had some warmer, damp air move into the area and the ice conditions in the Gastein valley are pretty sensitive to any changes. On the 8th of December, it was already clear that it was a bit more humid and the higher moisture level in the air was effecting the ice. The Link Dopple Lutscher was running with water at 13:00. As at the start of every ice season, it is best to be conservative in your choices and stay well within your ability level. You also have to be willing to just take your tools for a walk and check out things, leaving them for another day. Schitechnik im Gelände, 11.12.2016 - UPDATE!